My yoga practice is my comfort blanket, it reminds me that I am perfectly imperfect – I turn to it to find grounding; bring myself back to me; keep calm in the face of adversity; find space to breathe a full breath; and live a more conscious life in a world that is becoming more and more unconscious. Developing a self practice means that you have a ready to use tool at your fingertips to self support from life’s challenges. It counteracts the busy lives we lead and helps us deal with everyday situations. For most people home practice is the natural progression of their yoga path. Starting a self practice can feel quite daunting at first. We feel secure in the safety of a led class and go blank the minute we stand at the top of the mat at home. Online yoga classes can be useful to get a feel for practicing at home, but it’s important to remember one of the best things about yoga is how it gives you a break from the busyness of modern society, and a welcome chance to step away from technology and screens. Self practice lets you take ownership of your personal practice – tailoring to your specific needs; getting the most out of your time on the mat; and is available to you anytime of the day at home or when traveling. Empowering you to react to changing circumstances and find balance again. There is no secret formula to sequencing kept under lock and key! The best place to start with is some simple rounds of your favourite Sury Namaskara. They are designed to give you a little bit of everything to wake up the whole body. That is why you frequently find them positioned at the start of a sequence. Once you are comfortable, and you are ready to move on, add in some standing poses that you are familiar with. Getting to know your own practice – your strengths, your limitations, your favourite asana – helps you become more intune with your physical and emotional needs. It won’t be long before your intuition kicks in and you will instinctively know what poses to add to your practice for your requirements on each unique day. Accept that you may have a few false starts – it’s ok to miss a practice, if you don’t make it onto the mat don’t beat yourself up. You need to give yourself a bit of time to train your brain into this new healthy habit. You don’t need a sacred space to practice. Anywhere your mat fits is perfect – end of your bed, kitchen floor, sitting room. From the get go politely let your housemates know that while you are practicing you are not available for them. I have an ‘unless it’s urgent’ rule for when I’m practicing or meditating. 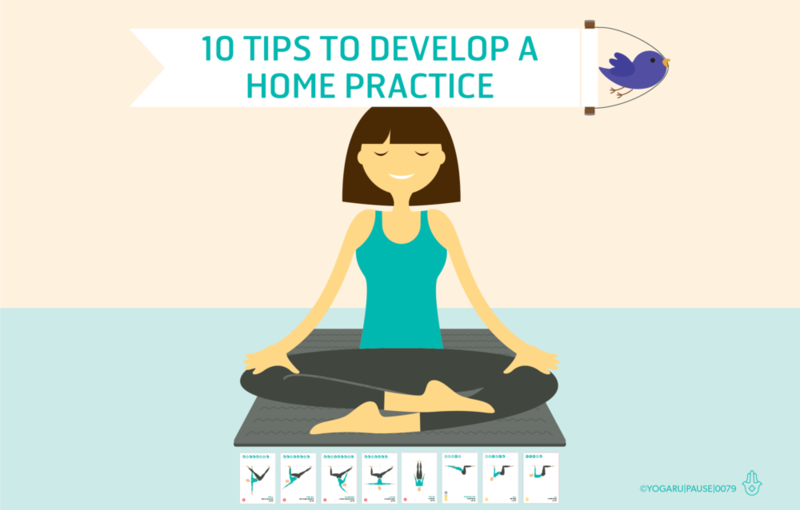 Try incorporate your home practice into your morning routine. I find getting on my mat before I start into anything else works best for me. With the best will in the world life, or housemates, can often take over and prevent you from getting onto your mat later in the day. At first, practice what is familiar to you. Bring a notebook to class and straight after write down a few poses that you enjoyed or are curious to explore in the comfort of your own home. Ask questions and get advice. Your yoga teacher will be delighted that you are progressing your practice. Move nice and slowly through your practice and enjoy being the boss. Get close to your breath, and take extra breaths in poses you are enjoying. Don’t panic when you need to move from one pose to the next. Keep your transitions simple and when in doubt link pose through a Downward Dog or come back to Tadasana and take a half Sury Namaskara. It doesn’t have to be a new sequence everyday. Pick a theme that will support you – a pose you’re working towards; an area of the body that needs attention; or finding support for a specific emotional need – and pick some poses that will help you achieve this. You will find info graphic to help you pick poses for specific needs on the homepage of my website. Practice the same or a similar sequence for one to two weeks. Moving on when you feel curious to try a new sequence or life has thrown a new challenge your way. My 108 Asana sequencing cards are the perfect tool to help you comfortably bridge the gap between classes and home practice. You’ll also find lots of ready made free sequences in the Sequences section of my website. Download them print them out and get started. Everyone has very different strengths and weaknesses. You can decide on certain days to work with your weak areas or on other days to enjoy your strengths. The best thing about your home practice is that you get to decide, and you can get the yoga ‘feel good factor’ everyday if you choose to.